(Nanowerk News) Astronomers using the TRAPPIST-South telescope at ESO's La Silla Observatory, the Very Large Telescope (VLT) at Paranal and the NASA Spitzer Space Telescope, as well as other telescopes around the world , have now confirmed the existence of at least seven small planets orbiting the cool red dwarf star TRAPPIST-1 . All the planets, labelled TRAPPIST-1b, c, d, e, f, g and h in order of increasing distance from their parent star, have sizes similar to Earth . Dips in the star's light output caused by each of the seven planets passing in front of it (astronomy) -- events known as transits -- allowed the astronomers to infer information about their sizes, compositions and orbits . They found that at least the inner six planets are comparable in both size and temperature to the Earth. 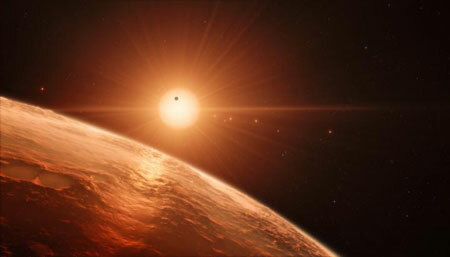 Lead author (Nature, "Seven temperate terrestrial planets around the nearby ultracool dwarf star TRAPPIST-1") Michaël Gillon of the STAR Institute at the University of Liège in Belgium is delighted by the findings: "This is an amazing planetary system -- not only because we have found so many planets, but because they are all surprisingly similar in size to the Earth!" With just 8% the mass of the Sun, TRAPPIST-1 is very small in stellar terms -- only marginally bigger than the planet Jupiter -- and though nearby in the constellation Aquarius (constellation) ) (The Water Carrier), it appears very dim. Astronomers expected that such dwarf stars might host many Earth-sized planets in tight orbits, making them promising targets in the hunt for extraterrestrial life, but TRAPPIST-1 is the first such system to be found. Co-author Amaury Triaud expands: "The energy output from dwarf stars like TRAPPIST-1 is much weaker than that of our Sun. Planets would need to be in far closer orbits than we see in the Solar System if there is to be surface water. Fortunately, it seems that this kind of compact configuration is just what we see around TRAPPIST-1!" The planetary orbits are not much larger than that of Jupiter's Galilean moon system, and much smaller than the orbit of Mercury in the Solar System. However, TRAPPIST-1's small size and low temperature mean that the energy input to its planets is similar to that received by the inner planets in our Solar System; TRAPPIST-1c, d and f receive similar amounts of energy to Venus, Earth and Mars, respectively. All seven planets discovered in the system could potentially have liquid water on their surfaces, though their orbital distances make some of them more likely candidates than others. Climate models suggest the innermost planets, TRAPPIST-1b, c and d, are probably too hot to support liquid water, except maybe on a small fraction of their surfaces. The orbital distance of the system's outermost planet, TRAPPIST-1h, is unconfirmed, though it is likely to be too distant and cold to harbour liquid water -- assuming no alternative heating processes are occurring . TRAPPIST-1e, f, and g, however, represent the holy grail for planet-hunting astronomers, as they orbit in the star's habitable zone. These new discoveries make the TRAPPIST-1 system a very important target for future study. The NASA/ESA Hubble Space Telescope is already being used to search for atmospheres around the planets and team member Emmanuël Jehin is excited about the future possibilities: "With the upcoming generation of telescopes, such as ESO's European Extremely Large Telescope and the NASA/ESA/CSA James Webb Space Telescope , we will soon be able to search for water and perhaps even evidence of life on these worlds." As well as the NASA Spitzer Space Telescope , the team used many ground-based facilities: TRAPPIST-South at ESO's La Silla Observatory in Chile, HAWK-I on ESO's Very Large Telescope in Chile, TRAPPIST-North in Morocco, the 3.8-metre UKIRT in Hawaii, the 2-metre Liverpool and 4-metre William Herschel telescopes at La Palma in the Canary Islands, and the 1-metre SAAO telescope in South Africa. TRAPPIST-South (the TRAnsiting Planets and PlanetesImals Small Telescope-South) is a Belgian 0.6-metre robotic telescope operated from the University of Liège and based at ESO's La Silla Observatory in Chile. It spends much of its time monitoring the light from around 60 of the nearest ultracool dwarf stars and brown dwarfs ("stars" which are not quite massive enough to initiate sustained nuclear fusion in their cores), looking for evidence of planetary transits. TRAPPIST-South, along with its twin TRAPPIST-North, are the forerunners to the SPECULOOS system, which is currently being installed at ESO's Paranal Observatory. This is one of the main methods that astronomers use to identify the presence of a planet around a star. They look at the light coming from the star to see if some of the light is blocked as the planet passes in front of its host star on the line of sight to Earth -- it transits (astronomy) the star, as astronomers say. As the planet orbits around its star, we expect to see regular small dips in the light coming from the star as the planet moves in front of it. Such processes could include tidal heating, whereby the gravitational pull of TRAPPIST-1 causes the planet to repeatedly deform, leading to inner frictional forces and the generation of heat. This process drives the active volcanism on Jupiter's moon Io. If TRAPPIST-1h has also retained a primordial hydrogen-rich atmosphere, the rate of heat loss could be very low. This discovery also represents the largest known chain of exoplanets orbiting in near-resonance with each other. The astronomers carefully measured how long it takes for each planet in the system to complete one orbit around TRAPPIST-1 -- known as the revolution period -- and then calculated the ratio of each planet's period and that of its next more distant neighbour. The innermost six TRAPPIST-1 planets have period ratios with their neighbours that are very close to simple ratios, such as 5:3 or 3:2. This means that the planets most likely formed together further from their star, and have since moved inwards into their current configuration. If so, they could be low-density and volatile-rich worlds, suggesting an icy surface and/or an atmosphere.